Are you looking to spread the word about your awesome work from home opportunity or resource? Then you have come to the right place. For the last eight years, Real Ways to Earn has been engaging people from all walks of life with regularly updated work from home content. We've been featured six times in Woman's World magazine (October 2013, March 2014, May 2014, August 2014, October 2015, March 2016, October 2016, and January 2018). 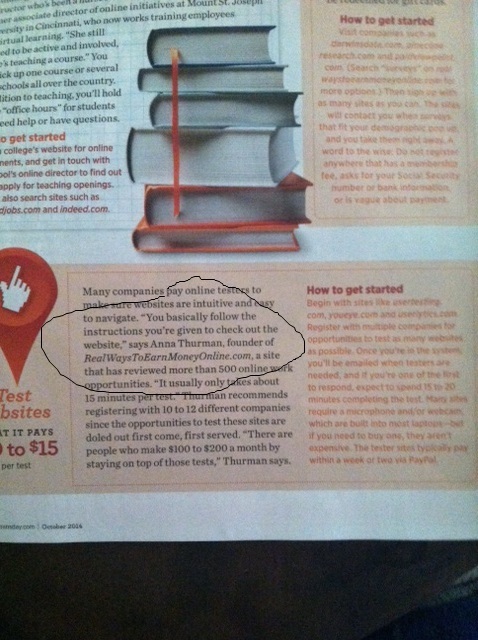 We've also been listed in Woman's Day (October 2014) in print and online. If you have a work from home opportunity or resource that you think would benefit these readers who are actively seeking ways to work from home, my advertising options make it very easy for you to spread the word! “Your post on us has given Voices.com SO many new signups! It is an absolute success, and we very much value the support, and the relationship. :)” – Trisha, Voices.com. 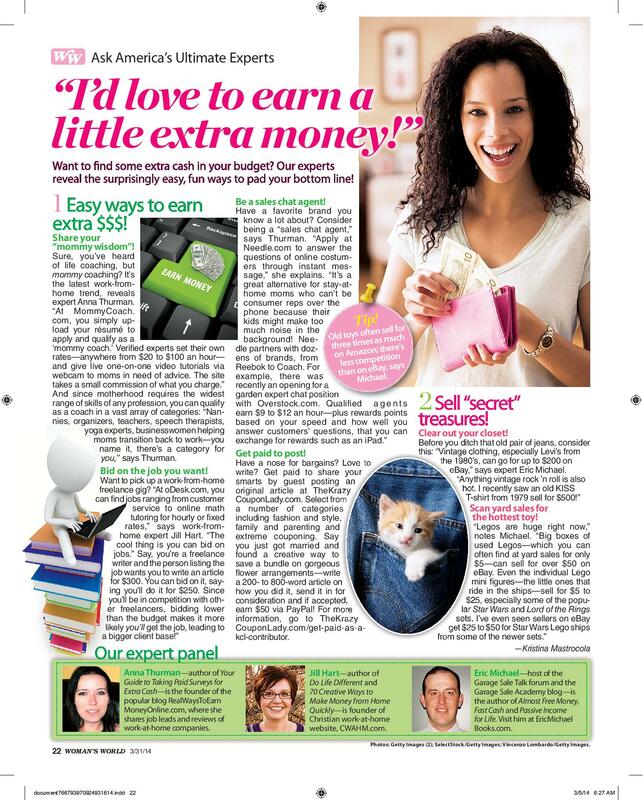 “It has been great advertising and partnering with Anna and Realwaystoearnmoneyonline.com! She truly supports us and our mission to help people with disabilities find Work at Home. In 2016, her website was in our top 5 referral websites! We also receive new applications for our services and jobs for people on SSDI or SSI who came from her website. It is a great reputable website and I look forward to partnering with her and finding new ways to work together. We also utilize the Work at Home job postings she has to help our clients learn about new Work at Home opportunities.” – Lori, MyEmploymentOptions.com. I don't accept advertising for business systems, turnkey solutions, internet marketing programs, pyramid schemes, non-product based MLM, Arise IBO's, online psychic or adult/PSO jobs. Everything is screened before approval so I can be sure that the opportunity is not only legitimate, but also would appeal to my readers. All sponsored content is labeled as sponsored so I'm in compliance with the FTC. All links inside sponsored content are no-follow so I'm in compliance with Google. No refunds are given once an ad has been paid for and placed. I reserve the right to remove sponsored content if it becomes necessary. While this is not typical, reasons for this would include your company going out of business, your company proving to be fraudulent, or any other reason which would make me feel I could not in good conscience link to your company on this website. These rules apply to all advertising options listed below, and absolutely no exceptions will be made. Thanks for understanding. I can place your job lead at the top of my popular New Job Leads page, currently receiving around 34,000 page views per month as of March 2019. Rather than float down as it ages like the other listings do, your listing will remain at the top for a full 30 days. Note that you can also list your work at home job with me for FREE, but free listings will not be pinned to the top of the page as the paid listings are and will float down the page as they age. Free listings can only be submitted once every 30 days. For job lead postings, the rules above apply. Your listing must be an actual work at home job, not a home business opportunity. This option is reserved for very established work at home companies with successful track records (few complaints from workers, in business for at least two years, etc.) with opportunities that will greatly appeal to my readers. You will get a short blurb (4-8 sentences max ) about your opportunity in one of my weekly newsletters. Looking to advertise a direct sales business? You can get a short blurb about your opportunity along with your link on this page. This page gets around 8,900 page views per month as of March 2019. Currently this is the only advertising option I have for direct sales opportunities. Please contact me (email below) for current rates. Email me at anna (at) realwaystoearnmoneyonline (dot) com and let me know if you're interested in any of the above options, or if you'd like more detailed information on my blog stats. I prefer email discussions rather than phone calls. I look forward to hearing from you!